These Don Gibson song lyrics represents some great classic country music ever, he was a great vocalist as well an excellent song writer. Don started recording in 1950 and recorded many hit records through out his long and very successful career. 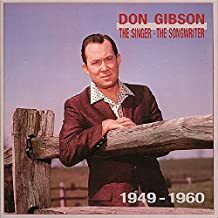 He was an excellent songwriter and many top entertainers recorded his songs, example, Sweet Dreams recorded by Patsy Cline. His music is still popular today, especially for us that enjoy classic country music. When Don passed away in November 2003, he left a void in country music and is certainly missed.